The Farm Holiday Sole Luna is just few kms from the center of Assisi and is located in the Park of Mount Subasio. This residence has apartments with one or more bedrooms, kitchen and bathroom. 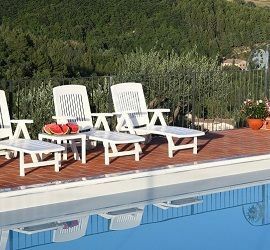 The garden of the Farm holiday offers a wonderful view of the hillside, surrounded by the beautiful swimming pool. Upon arrival, we will suggest places to visit, providing maps and detailed information on tourist cities, events and beyond. The villa has a private parking, a green area, gazebo, tables, barbecue facilities and a large common room and kitchen to use if necessary. At the Farm Holiday you can: walk or ride a bike in the park’s trails, stroll through the streets of historic towns, enjoy good food and Umbrian wines of our region. This, combined with the hospitality of staff will surely make your vacation relaxing and memorable. 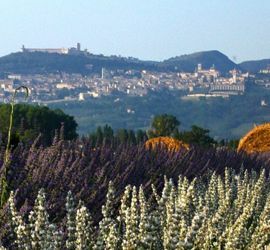 Share your trip on Facebook and on Mount Subasio Park blog: follow, contact, write your version about Umbria. We were in the early fall with a group of friends. We were welcomed with an amazing hospitality, high availability and courtesy, new rooms and well decorated, it has remained in our hearts … Ms. Dina … unique !! … We would highly recommend it !!! 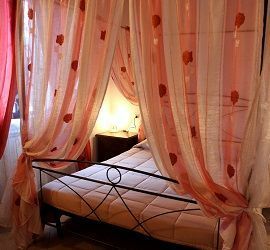 Everything immeasurably perfect from rooms to cleanliness, convenient location near Assisi. Especially the courtesy and kindness of Mrs. Dina and Sara. I highly recommend to all. Strategy for exploring the region. We were in Assisi a week in early September. We stayed at the Agriturismo Sole Luna in a spacious and clean apartment on the ground floor. Exit and immediately there is a beautiful garden where let the children play, a gazebo with a barbecue and a swimming pool with view. Assisi center is just a 5-minute drive away. Welcome and availability incomparable. Wait for us back.